With our first test of the 2017 YXZ1000R SS on the trails of the Big Buck GNCC racecourse in 2016, we knew that Yamaha had a car capable of going fast in the woods. 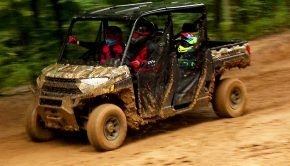 With our first test of the 2017 YXZ1000R SS on the trails of the Big Buck GNCC racecourse in 2016, we knew that Yamaha had a car capable of going fast in the woods. Along with its solid cornering stability, the addition of electronic paddle shifters allowed the driver to more easily harness the engine’s top-end focused power while keeping both hands on the wheel for improved control. 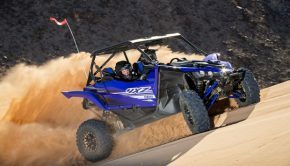 While its top-end focused power and taller gear ratios are somewhat limiting factors for serious rock crawlers, the YXZ SS is a capable trail cruiser with the potential to beat your buddies or win national championships. Just ask Factory Yamaha’s Cody Miller, the 2017 GNCC XC1 Pro UTV Champion. The YXZ SS is a capable trail cruiser with the potential to beat your buddies or win national championships. Just ask Factory Yamaha’s Cody Miller, the 2017 GNCC XC1 Pro UTV Champion. 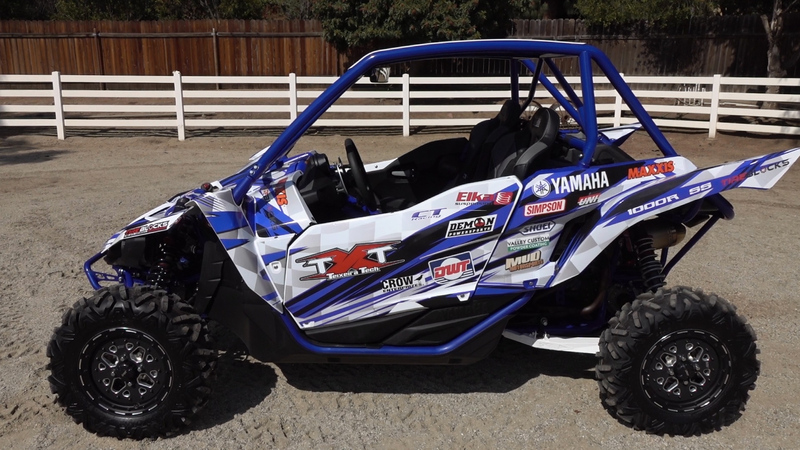 Teixeira Tech, out of Traci, California, aided in Cody’s success his first year out in the YXZ. They outfitted Cody’s 2017 car with their Xtreme Ground Clearance front A-arms and are working with Cody to develop more products for the YXZ. 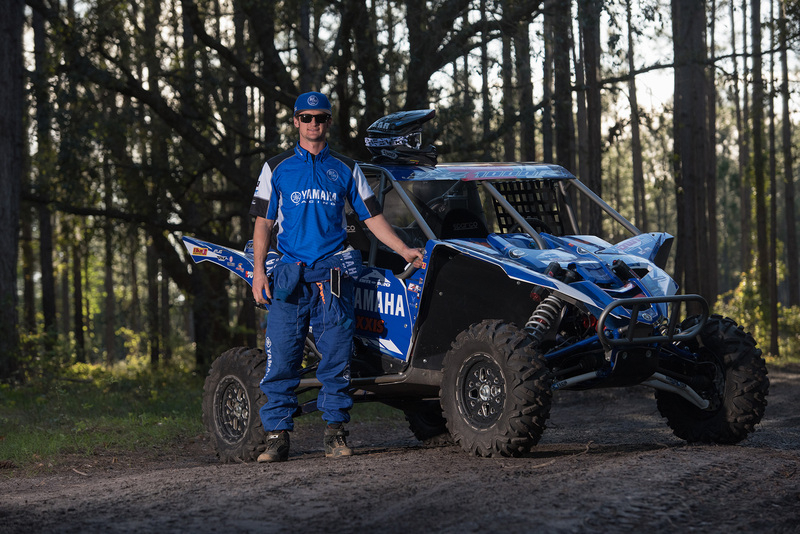 Based on what he learned working with Cody’s program and his own years of racing ATVs, Teixeira Tech owner, Ed Teixeira, built a Yamaha YXZ1000R SS offering a higher level of handling, durability, and safety, with which to develop and test new chassis and suspension parts for the Yamaha. This machine was setup to go fast in the trees and features nearly everything one would need to get started in cross country racing. 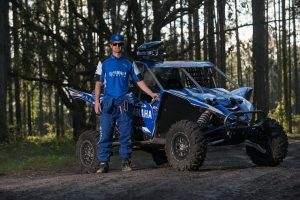 Built to develop new chassis parts for the Yamaha, Teixeira Tech’smachine was setup to go fast in the trees and features nearly everything one would need to get started in cross country racing. Ed Teixeira reached out to us and asked if we would like to come to California and put his personal YXZ1000R SS trail build to the test. 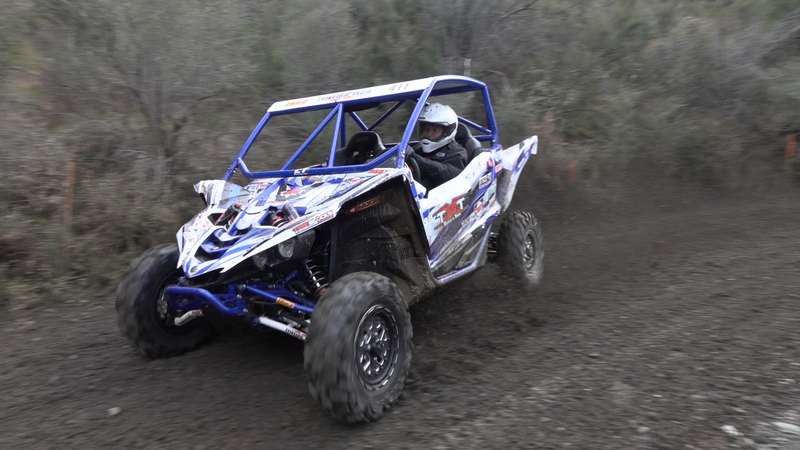 Bristling with production and prototype suspension upgrades, plus a number of hop-ups from other top aftermarket manufacturers, we flew out and met up with CT Racing engine’s owner and Off-Road racer, Allen Knowles, to evaluate the car’s performance. 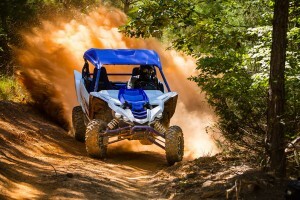 Testing took place at the Drinkwater Flats OHV area and El Mirage in the California high desert. 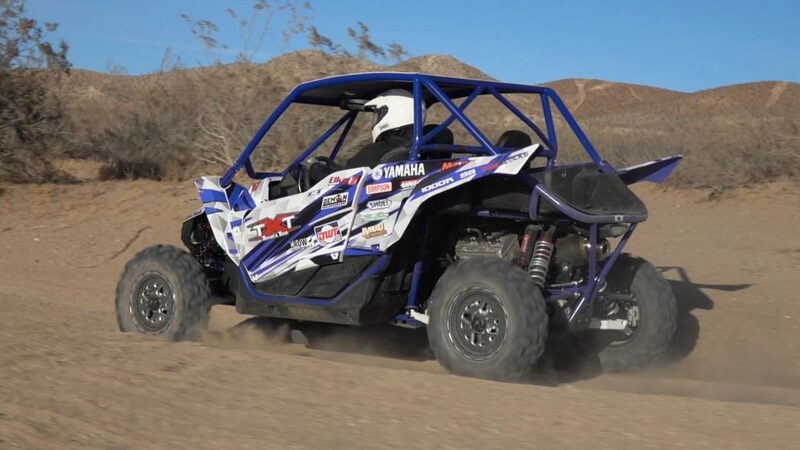 Allen has previous experience driving the standard shift YXZ at Yamaha’s first press intro at the Glamis sand dunes and he is typically full of valuable insight. Teixeira Tech builds all of their parts in house, in their manufacturing facility in Traci, California, not China. Built for the rigorous abuse of off-road racing, their chassis parts are constructed of high quality, U.S. made, 4130 chromoly. Many other companies are importing parts made out of cheaper and lower quality materials. Teixeira’s parts typically come powder coated black, with custom color options available. 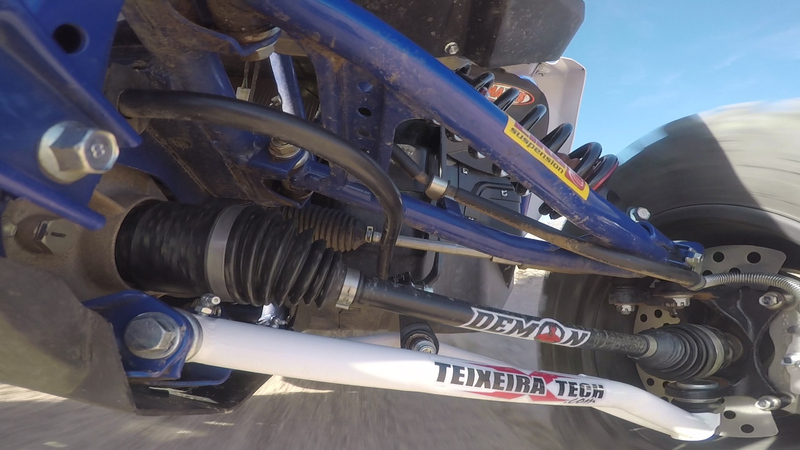 Teixeira Tech’s XGC A-Arms maximize ground clearance and slightly decrease caster. 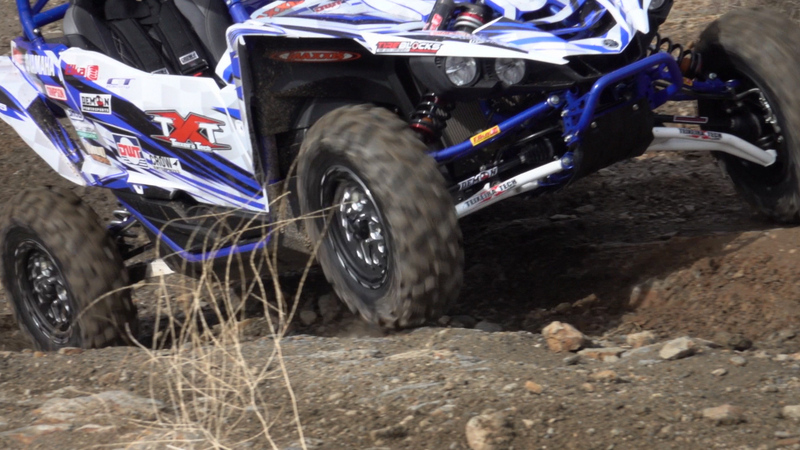 This improves cornering traction and allows the YXZ to turn in more quickly while decreasing steering effort. 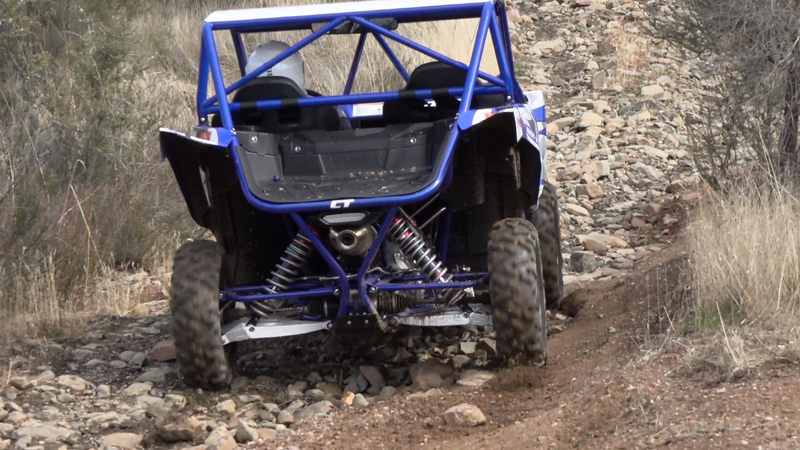 Teixeira’s YXZ transformation began with their Xtreme Ground Clearance, (XGC) lower, front A-Arms. 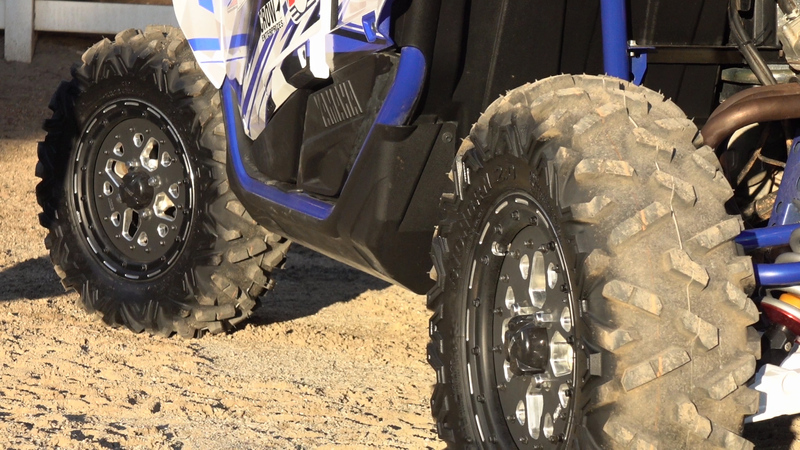 Their design helps maximize ground clearance over a wider area allowing you to more easily clear trail obstacles. Caster is a measurement of how upright or laid back the front spindles are. Teixeira’s arms slightly decrease caster. This improves cornering traction and allows the YXZ to turn in more quickly while decreasing steering effort. 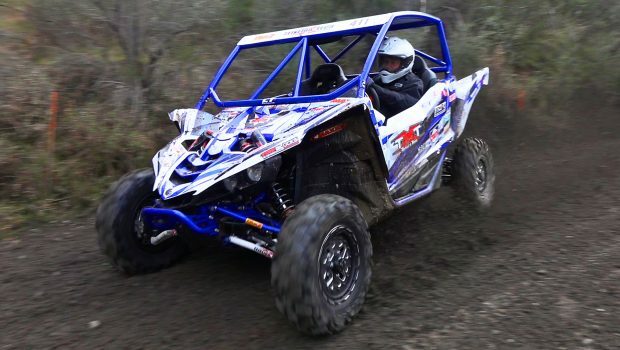 Thanks, in part, to the YXZ’S electronic power steering, steering remains predictable at higher speeds. The arms are designed to work with stock length OEM or aftermarket shocks and new pivot bushings are included. Like the front arms, they’re designed to work with stock length shocks. Out back, the car was outfitted with a set of Teixeira Tech’s prototype XGC lower A-arms. Like the fronts, they are designed to maximize strength and minimize weight. With this car lowered a bit for racing, the XGC arm’s 2” increase in ground clearance under the shock mounts is a big asset in rocks or deep ruts. 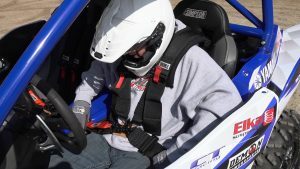 This area of the car can typically take a beating with the stock setup. We did take a few hits to the underside of the rear arms with no signs of damage, aside from minor scuffs in the powder coat. Like the front arms, they’re designed to work with stock length shocks. They’ll come with all the necessary hardware, and should be available very soon. 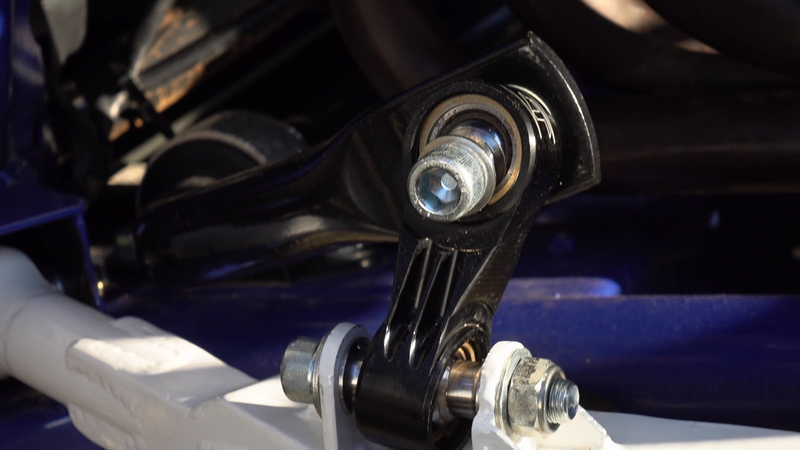 Teixeira Tech sway bar linkages are featured at both ends. They were developed to meet the demands of racers suffering sway-bar linkage failures on stock and other brand linkages. Teixeira Tech sway bar linkages are featured at both ends. They were developed to meet the demands of racers suffering sway-bar linkage failures on stock and other brand linkages. They feature lightweight, black anodized, 6061 billet aluminum construction and utilize American made, FK rod-end heim-joints. While increasing strength, Teixeira Tech retained the stock length having found longer ones to create turning issues affecting performance and durability. Hardened stainless steel and zinc plated hardware is used throughout for maximum durability and corrosion resistance. Elka’s Stage 5 shocks feature high and low-speed compression and rebound compression damping adjustments, in addition to threaded preload, allowing you to easily raise and lower the car for varying track or trail conditions. 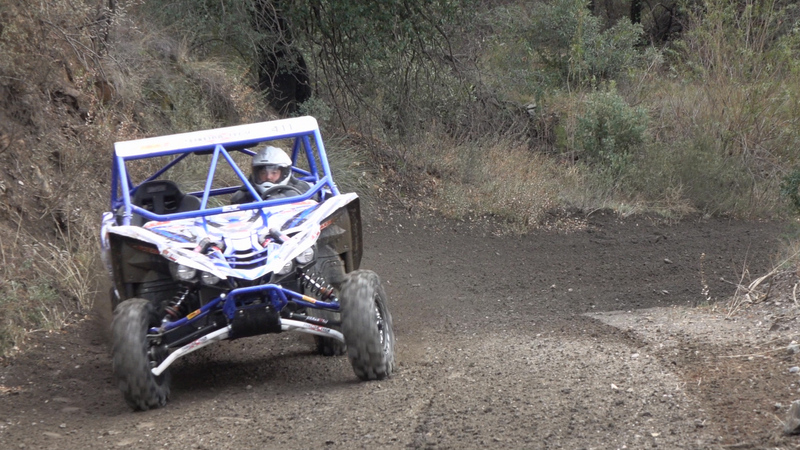 Looking to lower the car’s center of gravity and improve ride quality, Elka Suspension’s Stage 5 shocks were utilized. As the most adjustable shocks in their lineup, they feature high and low-speed compression and rebound compression damping adjustments, in addition to threaded preload, allowing you to easily raise and lower the car for varying track or trail conditions. Elka’s Stage 5 shocks feature lightweight aluminum bodies. They’re built for your intended use and are available for certain aftermarket or stock geometry control arms. Sitting lower in the suspension travel, you might expect the suspension to feel a bit hasher, but not in this case. Elka delivered the lower ride height we were looking for while taking a step forward in terrain conquering compliance. 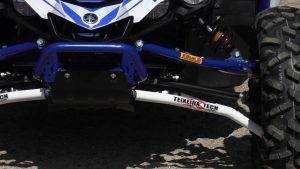 Yamaha’s already impressive cornering stability was improved upon with the machine’s lower ride height. We had to really mess up to get the car unsettled in a turn. Even then, it was easier to bring back and regain control. Elka delivered a lower ride height while taking a step forward in terrain conquering compliance. The Elkas do a better job of keeping the car tracking straight and driving forward in whoops, whereas the stock shocks struggle the most. With minimal tuning, the Elka shocks offered small to mid-size bump compliance that was a bit more compliant than stock. Bottoming isn’t a real issue with the stock or Elka shocks, although the Elkas do a better job of keeping the car tracking straight and driving forward in whoops, whereas the stock shocks struggle the most. 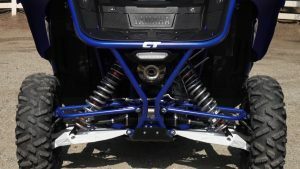 While it wasn’t installed on this car, if you plan on racing or just beating the heck out of your YXZ, you might want to consider one of Teixeira Tech’s 22 piece frame gusset kits. 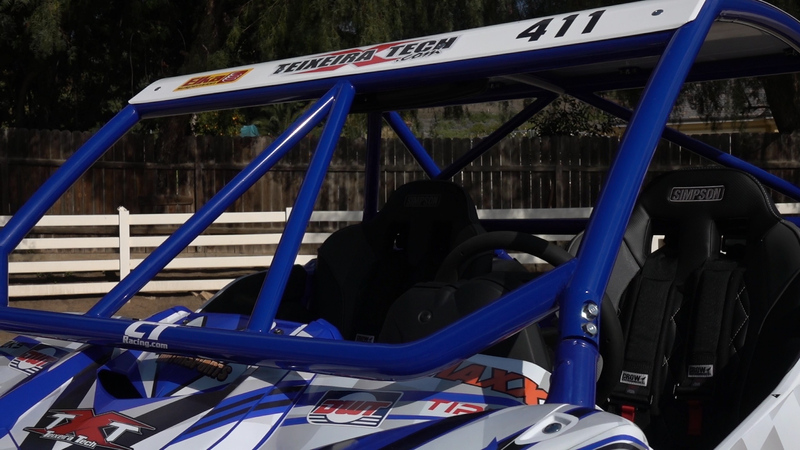 While it wasn’t installed on this car, if you plan on racing or just beating the heck out of your YXZ, you might want to consider one of Teixeira Tech’s 22 piece frame gusset kits. It is said to strengthen the frame where necessary, while still allowing it to flex where needed. The kit is comprised of CNC water jet cut pieces and CNC milled 4130 chromoly tubing. Additional strength, rigidity, and safety were added to this YXZ with a Cage Works roll cage, assembled and modified by Teixeira Tech. The cage was cut down and lowered a bit prior to welding it together. Additional strength, rigidity, and safety were added to this YXZ with a Cage Works roll cage, assembled and modified by Teixeira Tech. The cage was cut down and lowered a bit prior to welding it together. As with any race cage, intrusion bars are featured up front. Besides adding strength, they help keep large flying debris, such as other racers’ wheels, from entering the cockpit. Teixeira Tech topped the cage with a minimalist metal roof, attached with Zeus fasteners for quick installation and removal. 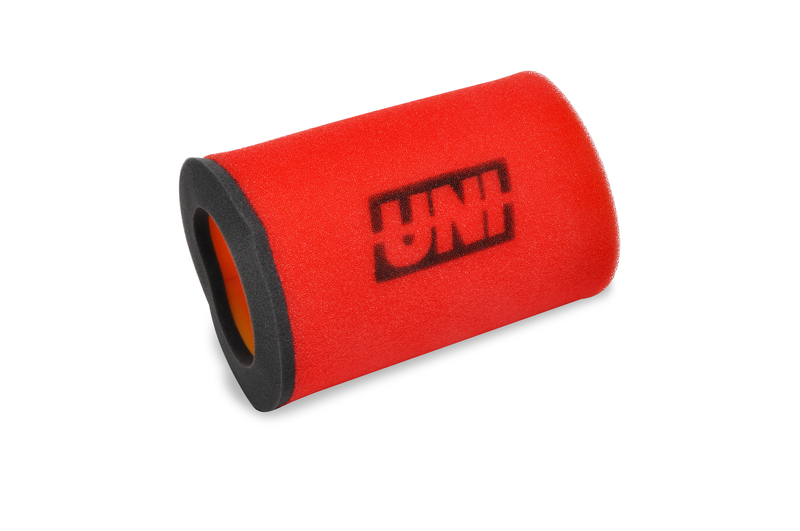 Uni filters have proven to do a superior job of keeping dirt out while letting air in. This was done to further ensure durability rather than increase power. While Teixeira Tech didn’t work to increase power, they did make a few changes to improve engine and drivetrain durability. The only real change to the engine was swapping out the YXZ’s stock secondary foam filter to one from UNI. Uni filters have proven to do a superior job of keeping dirt out while letting air in. This was done to further ensure durability rather than increase power. 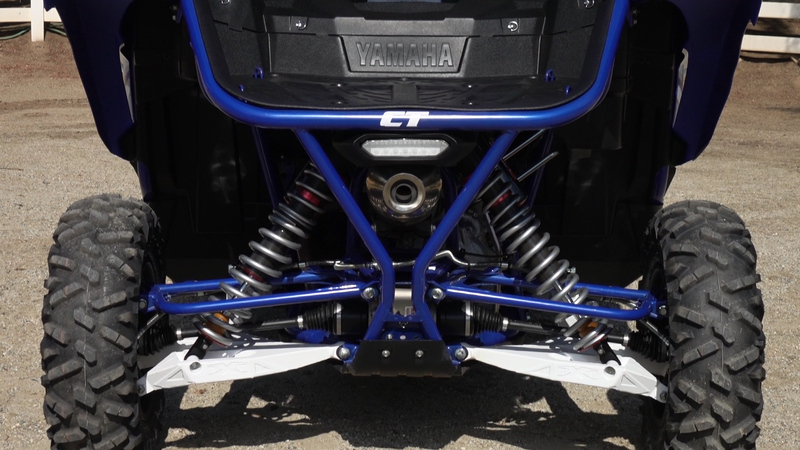 While Yamaha’s OEM Axles have proven stronger than other manufacturers, Teixeira felt an upgrade in axles was still in order for racing applications, so they swapped out to a set of Demon Powersports Heavy Duty Axles. They’re constructed of heat-treated 4130 chromoly, and feature a dual plunge design and thermos plastic polyester elastomer, (TPEE) boots. A larger diameter axle, increased CV joint size, wider articulation angles, and increase in plunge are all said to add up to an increase in strength. Our two days of filming easily put them through a couple rough cross country races worth of abuse with no failures, issues, or play in the CV joints to report. It’s a performance that many stock axles would struggle to duplicate. 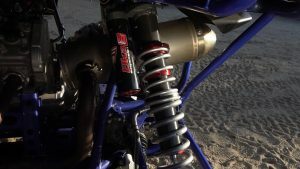 Demon Powersports Heavy Duty Axles. They’re constructed of heat-treated 4130 chromoly, and feature a dual plunge design and thermos plastic polyester elastomer, (TPEE) boots. Built in house in the USA, DWT says these wheels were designed to be the toughest wheel in the UTV market. 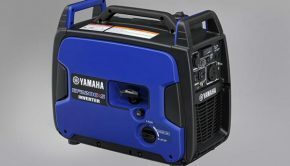 They provide a fully modular and serviceable three-piece design constructed of 6061 aluminum, heat treated for maximum strength. Beadlock wheels are mandatory for racing, and your wheels take a beating, especially if you get a flat, so it’s not worth skimping on quality. Teixeira’s car was setup with DWT Sector Zero beadlocks. 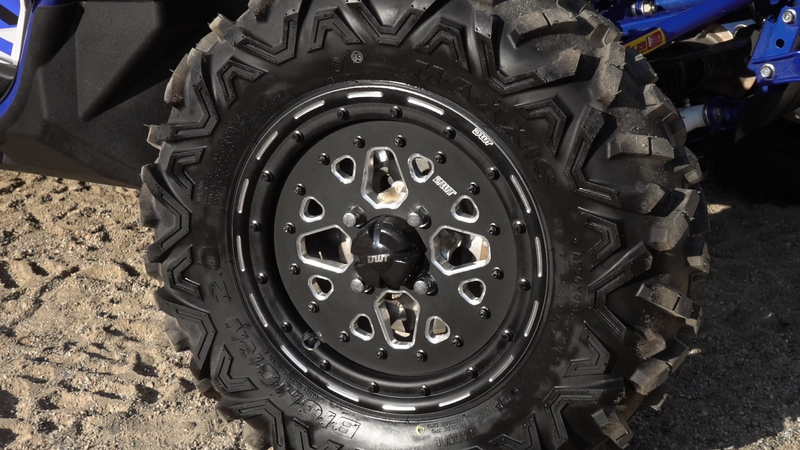 Built in house in the USA, DWT says these wheels were designed to be the toughest wheel in the UTV market, and they have quite a reputation for building tough wheels. They provide a fully modular and serviceable three-piece design constructed of 6061 aluminum, heat treated for maximum strength. There’s a spun .190 aluminum inner half and billet aluminum center/outer half, sealed together by a rubber ring that’s seated in a precision machined groove between the two halves. These wheels were outfitted with .190 deadlock rings although DWT offers an even tougher .250 thick option. The wheels bolt together using corrosion resistant black zinc plated bolts. 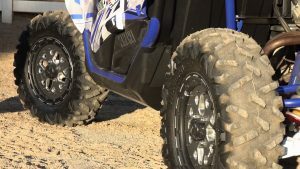 Sector Zero wheels are designed to provide zero offset, similar to stock wheels for improved handling and durability by reducing bump feedback to the chassis and steering. On the YXZ, the narrow 14×6” wheels used at all four corners, narrow the car by 1.5” measured at the wheels. This makes it a bit easier to slip through tight trail sections. While the DWT Sector and other wheels on the market typically add negative offset widening the car, the Sector Zero wheels are designed to provide zero offset, similar to stock wheels for improved handling and durability by reducing bump feedback to the chassis and steering. Less offset also means lighter steering effort making them ideal for racing applications. On the YXZ, the narrow 14×6” wheels used at all four corners, narrow the car by 1.5” measured at the wheels. This makes it a bit easier to slip through tight trail sections. After two days of hard driving, there were no surprises or problems to report. Maxis Bighorn 2.0 tires work well in many conditions and are one of the lightest multi-condition tires on the market. Maxis Bighorn 2.0 tires work well in many conditions and are one of the lightest multi-condition tires on the market. Bighorn 2.0s feature a radial design with a six-ply rating. They can be run in either direction so the tires can be rotated for longer tread life. Teixeira went down in size from 27” to 26×9-14 tires at all four corners. The shorter size lowers the car’s center of gravity for improved stability. It also essentially lowers and tightens up the gear ratios on the five-speed gearbox making it easier to get the engine to pull itself up into the top-end of the power band where it makes its best power. 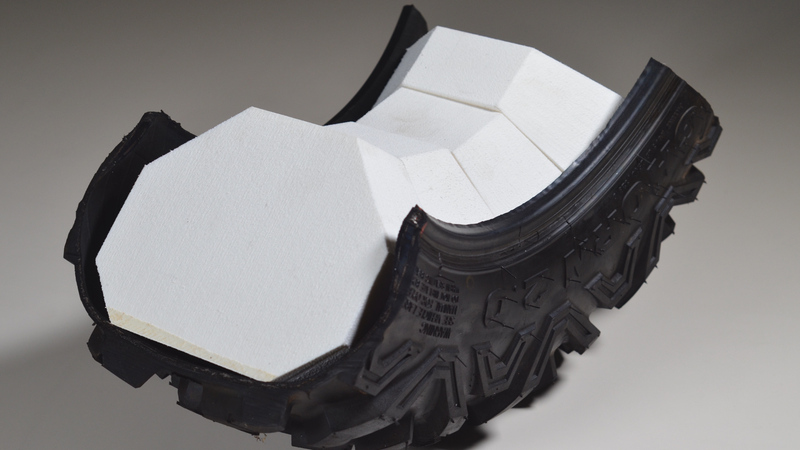 Tire Blocks allow you to keep the hammer down in the event of a flat. They also allow you to run lower tire pressure for improved traction. 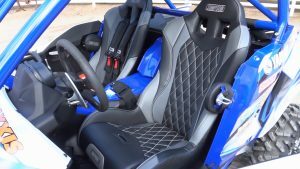 Simpson, Pro Sport Seats have high bolstering on the seat bottom and back and are setup for four of five-point harnesses. Maintenance is kept simple with removable seat bases for easy cleaning. Their look can be customized with different fabric and stitching color options. One of the best things you can do to greatly improve the comfort and control over your SxS is installing a good set of high performance seats. This build features Simpson, Pro Sport suspension seats. They have high bolstering on the seat bottom and back and are setup for four of five-point harnesses. Maintenance is kept simple with removable seat bases for easy cleaning. Their look can be customized with different fabric and stitching color options. With a thick plush suspended fabric base, the Simpson seats do well at sheltering your body from jolts that get past the suspension adding to the overall ride quality of the car. The seats’ bolstering really helps keep you solidly in place and in control. They also help add a feeling of security for both occupants. The seats’ bolstering really helps keep you solidly in place and in control. They also help add a feeling of security for both occupants. Simpson’s Door Latch Pads help protect your elbows from impacting the door latches when things get rough. Crow, 3×3 four point harnesses feature four separate straps make up the system allowing for easy seat removal and are also to take off in the event of an accident. One of our first upgrades to any SxS is a set of good harnesses. With this car being used for personal use, it was outfitted with a set of Pull down shoulder straps allow for easy adjustment and thick padding on the shoulder straps provides excellent comfort hammering through rough sections. Construction appears very good in-spite of this system being rated for recreational use. Of course, Crow offers race legal harnesses as well. 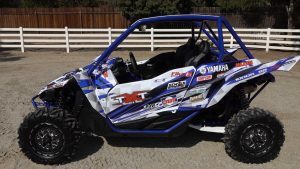 Mud Motorsports created a custom graphics kit for this machine. They offer many custom looks, which can be customized with your sponsor’s logos. Racing isn’t just about going fast; it’s about being seen for your sponsors. Unlike an automotive style wrap, graphics kits are much easier to install for the average person. 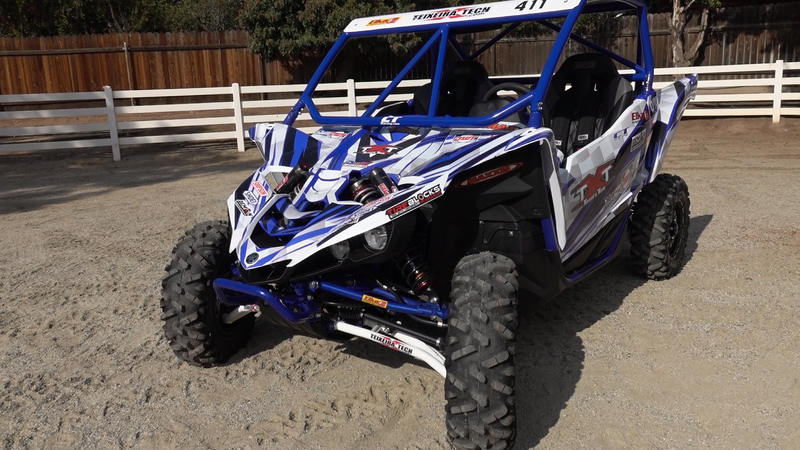 Mud Motorsports created a custom graphics kit for this machine. They offer many custom looks, which can be customized with your sponsor’s logos. Valley Custom Powder Coating powder coated that cage, roof, and Teixeira parts on this car. If you’re having trouble finding quality powder coat work, their finish looked pretty flawless and they matched the OEM colors perfectly. If you’re building a YXZ to go fast through the woods, your car has to be prepared to do battle with trees, stumps, ruts, rocks and roots. If you’re going racing, you also have to be prepared to deal with other cars as well. 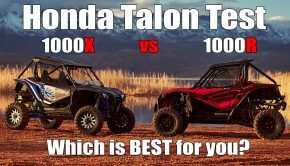 If speed is your game, you don’t want to skimp on quality parts as buying an inexpensive and cheaply made part twice is nearly always more expensive than purchasing high-quality parts the first time around. If championships are on the line, one DNF is all it takes to ruin a season. While there are a few missing items required to make this car race legal, it has nearly all of the pieces in place to compete and finish a grueling cross country race. We beat on this car for a couple days with zero issues to report. If you are the type of YXZ1000R owner who likes to drive your car like the true sport machine that it is, you might want to consider reproducing this car’s setup. While we would really like to see CT Racing extract some more low-end horsepower from this machine, despite the lack of motor mods, this car performed better in nearly every way out on the trail, especially when it comes to going fast. If you are the type of YXZ1000R owner who likes to drive your car like the true sport machine that it is, you might want to consider reproducing this car’s setup.